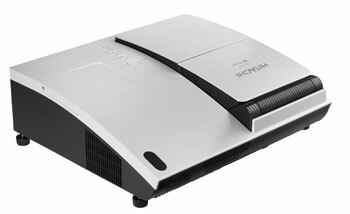 Hitachi this week debuted a new projector for the education market, the CP-A100. The new 3LCD model is capable of projecting a 60-inch image from a range of 1.4 feet. So teaching class in the broom closet shouldn't be a problem anymore ... aside from the crowding. The new model isn't just about short throw distance. It's also networkable to allow for remote operation and monitoring. And, aside from its ability to be ceiling mounted, it can also be positioned horizontally or vertically. The CP-A100 is expected to ship by the end of October for $2,995.